It's been a busy holiday season for me. With Pumpkin's final exams taking place the last possible week of school, it made for a rushing of family visits here and there and every where! I hope you had a wonderful family celebration! 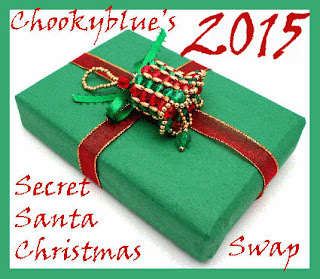 Every year, I participate in Donna's, chookyblue's, Secret Santa Swap! I've been a part of it from year one. I wouldn't miss it for the world! 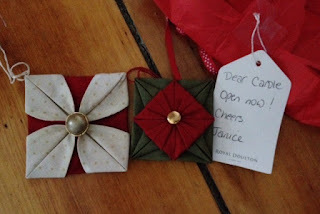 My secret Santa this year was Janice, from Australia. The parcel arrived, so nicely wrapped. I was allowed to unwrap one package before December 25, the ornament. Don't they look pretty on the tree? This is what Janice sent me. It's beautiful! The colours are vibrant! The picture does not do it justice! DH suggested we use it on the dinning room table for our family holiday dinner .... NO WAY! He's not getting gravy on that gorgeous table runner! Stephen is "suppose" to be working on a credenza for the dinning room. So I quickly took the opportunity to remind him that had he finished the project, that's where the table runner would go! I think I need to crack my whip! Thank you again Janice for the lovely gifts! Cheers! Hope Santa brings you lots of gifts! 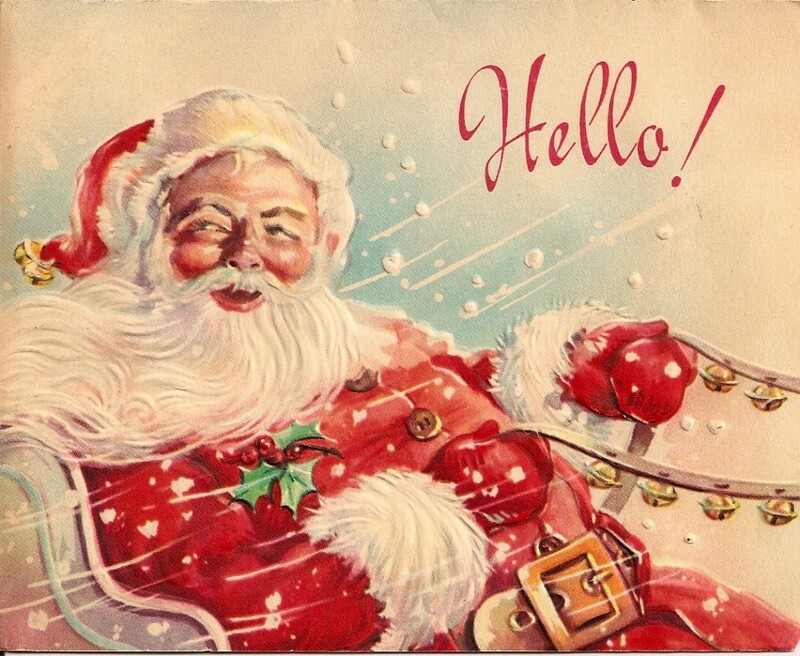 Wishing you all a very Merry Christmas! Cheers! Tourtiere, a French Canadien Tradition ...! Have you noticed that today very little that is sacred? We are so fortunate to have access to all types of foods throughout the year. When I was growing up, the seasons determined what fruits and vegetables we would consume. If it was "out of season", canned goods is what was served. Gosh, I remember the wonderful Epluchette de ble d'inde (corn roast) that my uncle Maurice would host. It was the only time we had fresh corn on the cob! Delish! It was a huge family gathering, distant cousins were invited. Today corn is available all year long. How special is that? Candy was not something I had access in my youth ... neither chips and/or soda. Those were reserved for "special occasions". I also did not have access to money that would allow me to buy candy at the corner store. Gosh did we look forward to the holidays! Halloween was such a treat, it had been so long since the Easter Bunny stopped by! I find that today very little, in terms of foods and what not, is reserved for "special occasions". Most kids have access to candy all year around. What do you put in a stocking when candy is constantly in abundance? As you can imagine, I did not raise my daughter on candy. I kept those for "special holidays." I guess you can say I'm a tad old fashion. I try to hang on to my family traditions. For instance, a traditional dish that I make for the Christmas holiday is Tortiere (meat pie). My mother and I will get together mid December and bake all day. We even use my maternal grandmother's recipe. The dish is served at Christmas dinner along with turkey! This is this year's batch! It's wonderful to have left overs! I think today, more than ever, we need to honour our family traditions. Do you have any family traditions that you cherish? Something naked .... I hope you like it! Late November, she sends me an e-mail saying that she sent me something "naked". "Some people do not like the naked look, but I tend to like it." Ok, so Cheryl likes the naked look! You can just imagine what was going through my mind! Hum .... something naked all the way from Australia ..... interesting! Well the box arrived this week. Oh .... Gorgeous Australian "naked" wool! It is stunning! I can see why she likes it "naked" .... So do I! I cannot wait to plan a project with this gorgeous yarn. Any suggestions? There's also a couple of skeins of finger weight yarn ... I'm thinking socks! As I knit away I can watch the Lake Eyre collection! I hope to one day visit Australia! Cheryl takes it upon herself to educate me regarding the culture and customs! I just love it! Thanks for stopping by my little corner in cyberspace! Cheers! I have so much to be grateful! Thank you for being a part of my cyber family! 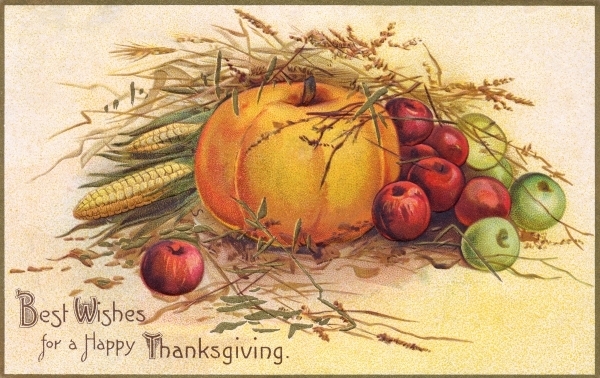 Wishing you and your loved ones a wonderful Thanksgiving celebration! Enjoy the abundance in your life! Cheers! 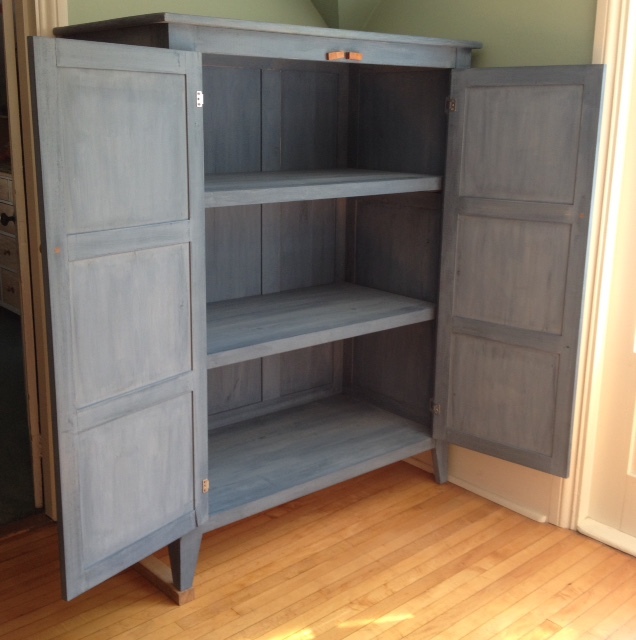 Fall Market 2015 ... some Saturday Evening Highlights! This post certainly "should" have been written back in October .... but you know how it is? I had the privilege of attending Moda's 40th anniversary dinner and sat with two lovely ladies. 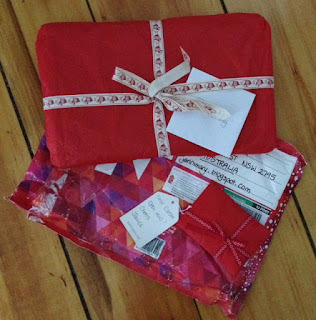 Okay, they are one of my favourite, favourite fabric and pattern designers. Meet Alma Allan and Barb Adams of Blackbird Designs. I'm sure you can tell how unhappy I was to have my photo taken with these beautiful ladies! lol What great dinner conversations we had! The anniversary party was a blast, I even had a chance to meet another of my favourite pattern and fabric designer. Can you guess who it is? Lisa Bongean of Primitive Gatherings! That evening, I sent this picture to Diane, a friend of mine, (Primitive Gatherings also happens to be one of her favourite designers) and mentioned "Guess who I'm with?" Diane's reply was "your sister?" I laughed hysterically! Moda puts on a great party! Great food, great company and lots of dancing ... what more could one ask for?! Thanks for stopping by my little corner of cyberspace! Enjoy your day! Today is my birthday. Hard to believe that I have been on this earth 56 years. My, how time flies! Seems not to long ago, I was enjoying the carefree attitude of a child! My life, thus far, as certainly been interesting. Nothing I would have ever dreamed in a million years! Funny how that is. You think you have it all figured out, a life course well planned out and BAM ... On a different path you go! I can honestly say that I no longer know where I am headed, not even sure it's important anymore. I seem to have taken the attitude of "going with the flow". I think age does that to you... well it did to me! Sunday, I visited a friend, Loretta, in Montreal and she surprised me with a birthday celebration! Today, I had a surprise visit from my mum, brother and his wife. They drove all the way from Montreal and brought lunch for us to enjoy at Fibre Junction! What a fun way to celebrate a birthday! 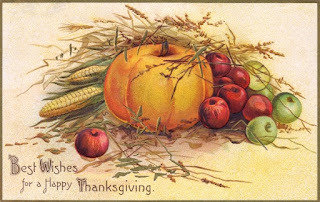 Received lots of phone calls, (my little Pumpkin called and made it that much more special), cards, gifts and e-mails (from friends and fellow farmgirls)! I can say with honesty that 2015 turned out to be a good year to celebrate my birthday! Thank you to all that made it special, you know who you are! Have you heard the latest? Moda has come out with these collectible tins called Frivols! I am such a push over for tins! Check out Frivol 1! It even has a clear top!!!! Every month Moda issues a new Frivol tin that features a designer pattern and a new fabric line! Last month Bonnie & Camille were featured. 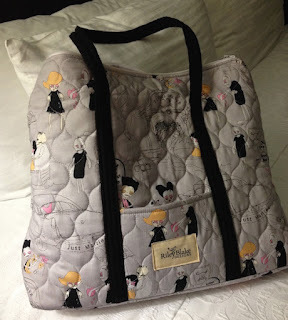 The pattern is called Kindred and they used the fabric line Hello Darling! Here is my completed top! So, if you read in the news that a quilter has been injured by a Moda Frivol tin avalanche, that would be me! I'm hooked! My little Pumpkin has left for college. It has been an adjustment for both of us... and .... It's all good! Before she left, we spent a lot of mother daughter time together. One Sunday, we decided to visit this huge mall in Albany that has a "Build a Bear" workshop. Have you ever been? What a great idea. As you build your bear, you come to a point where you must add a heart. Well, Pumpkin and I traded hearts. My bear has her heart and hers mine. Isn't she the cutest? Her name is Pumpkin! As you can imagine, there hasn't been much quilting going on, but I did get a bit of sewing. Yea, you read right, sewing NOT quilting. 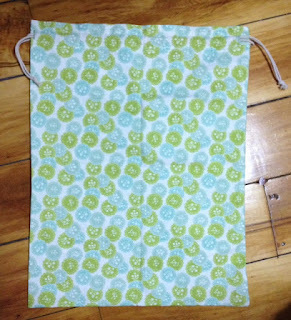 I really do not like to sew but Pumpkin, the other one, needed a laundry bag. So, I designed this little bag. I'll admit, it wasn't that bad. I even used the button whole feature on my Bernina. Check it out! 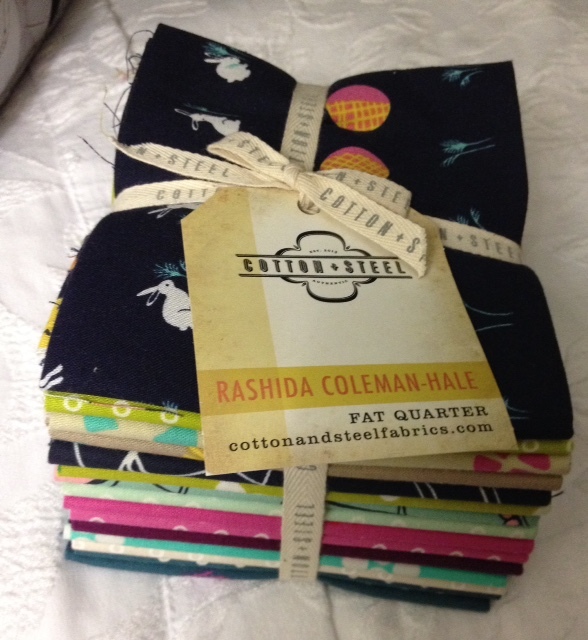 The fabric line is Scrumptious by Bonnie & Camille. I love that line! 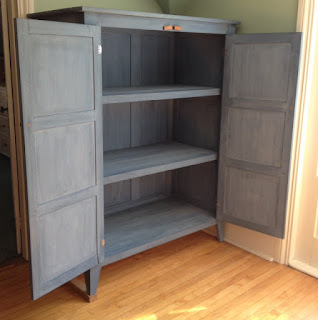 I've been after DH for a while now to build me a quilt cabinet. I was tired of having my quilts stacked here and there and every where. After discussing some specifications, this is what he built for me. Notice that it is not filled, yet! That's on my "to do" list today! I best be getting off this computer and working on that! For the record, thread does not have an expiry date. If you take good care of your thread, that is, you keep it out of the sun etc .... there is no reason why it shouldn't last. Today, I am hand stitching the binding on a quilt to be used as a sample for the shoppe and guess what I'm using? My grandmother's thread. As I stitch the binding, I think of my grandmother, Yvonne, and how I miss her so much. I am reminded of her many talents and joie de vive. 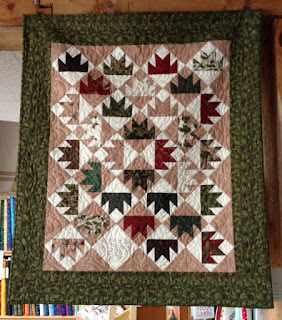 Quilting for me is a way to reconnect with the past. Some memories are personal and some are not. When I use reproduction prints, I think of the women from that era and the joys and hardships they endured. Their daily motto of make do or make without, something that is foreign to many of us today! As I piece a quilt for someone, that individual is constantly on my mind. The quilt becomes imbued with memories and personal energy. When I look at that project, the stories come to mind, the same way the thread evokes memories of my grandmother. Every quilt has a story! This is a reminder for me to take the time to enjoy the process. It's not a race or contest of "how many projects can I complete" but more of a slowing down and enjoying the quilt story as it unfolds and evolves with every stitch. 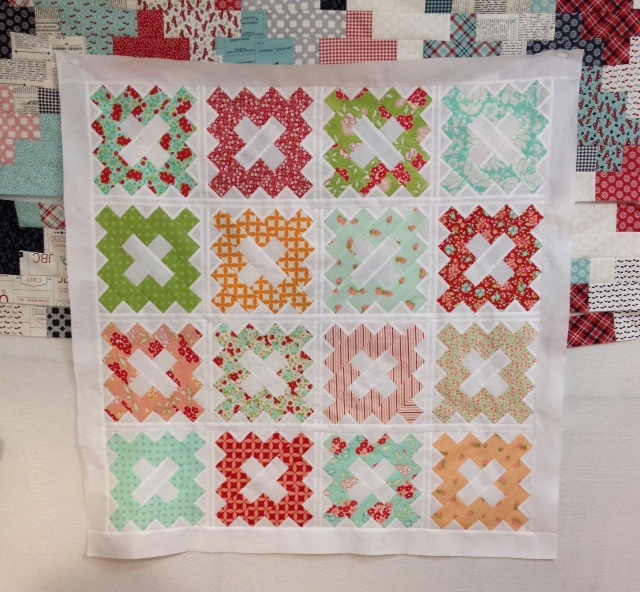 How is your quilt story coming along? How's the weather in your neck of the woods? Here we have been getting lots of rain. I actually had to empty out my pool again. No complaints! Water is good! I've been spending some quiet evenings getting some much needed down time. In between enjoying a good book, something I haven't taken time for in a while, and some English Paper Piecing, I managed to get this little gem finished. 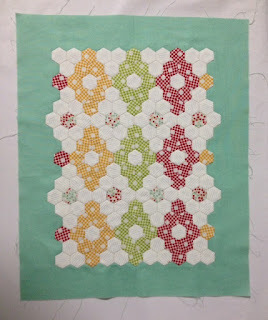 I used 1/2 inch hexagons and the quilt measures 14" x 17". Amazing how much time goes into a tiny quilt like this. But oh .... so enjoyable to piece! I'm in love with EPP. 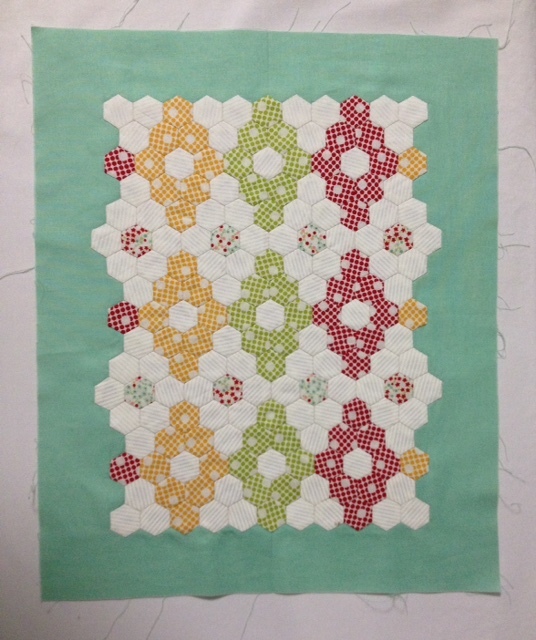 The pattern is called Little Things - Hexagons - by Sue Daley. Love, love love her paper! As a matter of fact, that's the only English paper templates Fibre Junction sells! So what have you been up to these days? Thanks for stopping by my little corner in cyber space! Back to our regular schedule programming ....! Have you seen this cute Little Bites pattern by Miss Rosie & Co? They allow you to work with mini charm packs! What fun! 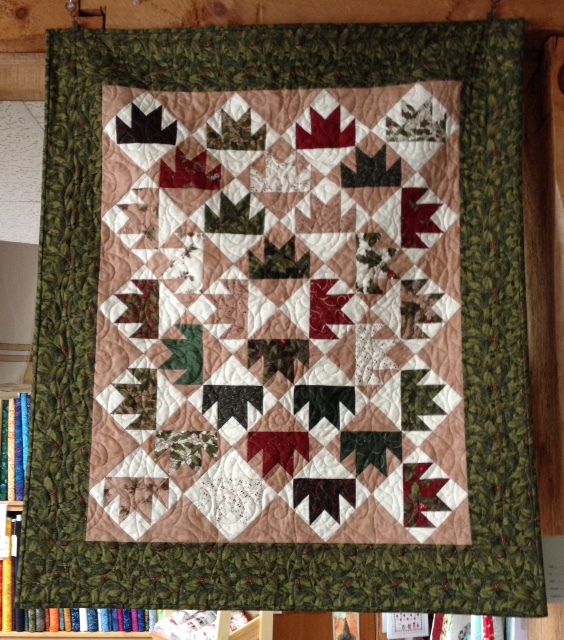 I love flying geese so I just had to make this cute little quilt. I choose Daysail by Bonnie & Camille! Once all pieced .... and it does go quickly .... now for the trimming! Sew them in rows and you have this most adorable little quilt! I call mine "Which way north"! What I like about these mini charms is that it allows me to work with a full line .... what fun .... and without a huge investment! Thanks for stopping by my little corner in cyber space! So what have you been up to these days? Cheers! Life, the universe and ..... ! Since Pumpkin's graduation day, it has been so busy. So much is going on that it's making me dizzy! Not much time for quilting, that's for sure! We have been getting some much needed rain. Check out the pool! We're talking 6 inches over filled! I decided to let the sun take care of it! The campus is on a hill and over looks farm lands! It is also know for their magnificent sunsets! This was our view from the MacVittie College Union building as we, the parents, enjoyed an evening dessert and coffee! The most interesting icon on campus is their sorting hat! The college has a huge Harry Potter fan base, they even have a quiddish team! lol Being a dedicated HP fan myself, I see it as a sorting hat but if you are a Dr Seuss fan, it is also know as the Seuss Spruce! No matter which side you view it from, it is an interesting natural phenomenon! Thank you for stopping by! I'm hoping that life will settle a bit and that I may get back to my "normal" life. Cheers! Pumpkin's high school graduation as come and gone. Last night was full of excitement, as the young graduates move on to a new life adventure! I am an extremely proud mama! Such a bittersweet moment. This weekend will be full of celebrations, with family coming from near and far! On the quilting front, I continue to work on some Kim Diehl, Collection 2 projects. I just love that line of fabric. Here is another finish. I call this one Hex away! This little quilt measures 12" x 14". It's small alright! The pattern is called Honeycomb and kits are available from Fibre Junction here. Thank you for stopping by my little corner in cyberspace. I hope you have been enjoying life! Cheers! In just a couple of weeks, my baby will be graduating from high school. It's just not possible! Next thing you know, she'll be off to college! Please, someone slow time a bit! Sigh! 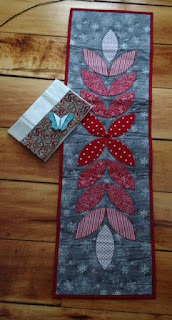 On the quilting front, I have been busy getting some small projects done. I've been working on Kim Diehl's Simple What Not Club - Collection 2. I call this one Project Blue Book! That's it for me now. I'm off to prepare for an alien invasion. You just never know if those conspiracy theorist are speaking the truth. LOL Cheers! Hard to believe that my baby turns 18 today! You have brought so much joy into my life! You have such a great sense of humour! Your dedication and perseverance to whatever you set your mind to is commendable! I am so proud of your numerous accomplishments. Thank you for being in my life!